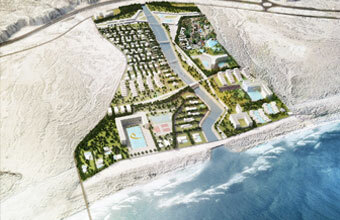 The Special Economic Zone Authority in Duqm granted Al-Khonji Real Estate & Development LLC ”AQAR” the usufruct right to construct a touristic project that includes hotels, residential and commercial complexes, and an amusement park. The usufruct agreement was signed, in the name of the Authority, by H.E. Yahya bin Abdullah Al-Jabri – Chairman of the Board of Directors, while it was signed, in the name of the company, by Mr. Mohammed bin Abdullah Al-Khonji – Chairman of the Board of Directors and CEO. The signing of this agreement comes as a part of the Special Economic Zone Authority in Duqm´s efforts to encourage Omani investors to invest within the Sultanate, and in accordance with the efforts of the government to diversify the national income and identify rewarding investment opportunities to the national private sector. As per the agreement, Al-Khonji Real Estate & Development LLC ”AQAR” was granted the usufruct right to develop a land area of approximately 661 thousand square meters to construct a touristic and real estate project to be executed in numerous phases, with a total approximate cost of 390 million Omani rial, and it is expected that the project will create almost 4 thousand direct jobs when it is completed. The project consists of many phases, and according to the company´s statement, the first phase will include the construction of a 3-stars hotel, which is expected to be finalized in the first quarter of 2019. The project also includes the construction of a commercial complex, villas and residential units, which would be offered to both local and foreign investors, hence becoming the first project with units offered for sell in the Special Economic Zone in Duqm. According to the master plan, the amusement park will be finalized by 2020 and the health complexes by 2022. Al-Khonji Real Estate & Development LLC ”AQAR” stood-out in the past few years as one of the leading Omani companies in the real estate sector, and had developed various commercial and real estate complexes in the Governorate of Muscat as of the most notably “Rimal 1” , “Rimal 2” and “the office”. The touristic sector is considered as one of the key sectors as of the focus of the Special Economic Zone Authority in Duqm, due to the moderate temperatures of the area during the summer. And during the past few years, many usufruct agreements were signed to construct a number of touristic projects in the area facing the Arabian Sea.